The outer face of the upper leaf has a lunar volvelle with time correction scales for hours and minutes, and the cardinal points named in the borders. At the top is a list of cities with latitude 51? (thirteen) and 54? (twelve). The inner part of the upper leaf has a pin gnomon dial with Italian hours (marked from 13 to 24 in red), Babylonian hours (marked I to XI in green), day and night length with the inscription 'Tag Le ng' 'Nacht Le ng'. There are four string attachment points for latitudes 45?, 48?, 51? and 54? and the inscription 'Erstlich Zih den Faden in Das Lochlein Nach deiness La[n]dts polus Oder welche Am Nechten Darbey ist' ('firstly put the string into the slotlet according to the pole of your country or which is the nearest to it'). Below it is a list of 21 places with latitude 45? and twenty places with latitude 48?. At the bottom of the leaf is the signature and date 'HANS DR?SCHELL NORMBERG FACIEBAT [star] 1584'. On the inner side of the lower leaf is a compass (glass cracked) with the cardinal points marked 'SE', 'OR', ME', 'OC' and a string gnomon dial with common hours marked 4 to 12 to 8. The dial has four rings, for latitudes 45?, 48?, 51? and 54? (marked 'pol ?45? ', 'pol ?48?' 'pol ?51? 'and 'pollus ?54?'). 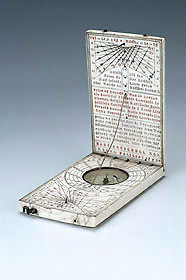 Below it is a pin gnomon dial with the declination of the sun indicated by zodiac names, Italian hours marked in red from 10 to 23, and common hours marked VI to XII to VI. At the centre is the inscription 'POL VS 49 DIES HORARVM XVI [star]'. The outer part of the lower leaf has the maker's mark punched three times and the quality mark 'n' for Nuremberg.